Homepage. This page: Dating to the early 1930s, a specially-designed puller designed to aid the removal of car and lorry wheels. The "Mason" universal wheel puller. 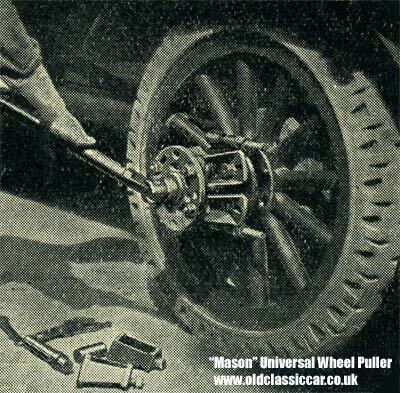 Designed and used by garages in the 1930s, the "Mason" universal wheel puller was designed to speed up the removal of stubborn road wheels, on any vehicle that came in for a service. The illustration shows the tool being used on a sturdy wooden spoked wheel, probably on a commercial vehicle of the 1920s. Several adaptors are shown on the garage floor in the photograph, so it could probably handle plain disc wheels and also spoked car wheels just as easily. The legs of the puller are fitted, and pressure is applied to the rear of the vehicle's wheel spokes, hopefully pulling the wheel free of the hub without damage.